Here’s a funny, slightly surreal photo for Week 4 of the 52 Week Project. It looks to me like a scene from an old movie, featuring a small blonde intruder who has snuck onto the set. We went on a lovely Dorky Adventure today – a morning at the London Transport Museum, followed by lunch at a steak house in Covent Garden. 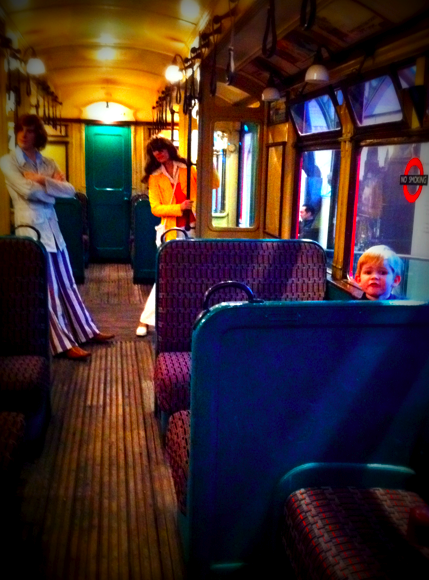 The museum was great – lots of old buses and trains for climbing into, as well as a demo car from the new Emirates Air Line, which for some reason was DorkySon’s favourite. As you can see from the picture above, DorkySon discovered that there is a big advantage to being toddler sized – you can slip past the security barriers and into some of the trains that aren’t supposed to have visitors. Although why you’d want to get any closer to those creepy mannequins is beyond me. Great photo! But you are right it is definitely surreal!! Glad it’s not just me that thinks that! Brilliant picture…. how very clever of Dorky son to make full use of his size! I have hopped here from the mention on you on New Bloggers’ Fortnight.. Thanks for popping over – it’s a great museum isn’t it? !